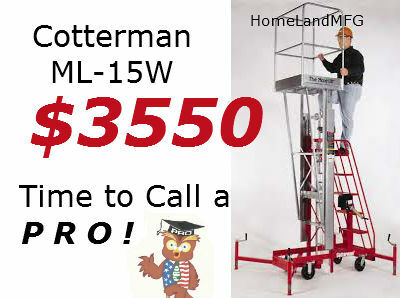 Cotterman ML15W, our economical manual winch, Maxi-Lift rolls thru a 36" wide doorway. This Manual Winch MAN LIFT is simple to use and maintain. This MAINTENANCE LIFT is quickly elevated to the desired working height with a hand crank winch then the user climbs a ladder to the platform. A built in safety features include a friction brake on the winch and outriggers that can be placed in an X pattern or rectangular. In addition, in case the cable is cut or snaps, a spring loaded mechanical stop engages as soon as tension is released from the cable, preventing a vertical drop.